HomeBusinessIs the Real Estate Market Recovering? The Fed is talking about an exit strategy these days, including selling its existing stockpile of mortgage securities, which it purchased in large quantities over the past 18 months to boost the sagging fortunes of the housing industry. It may be coincidence, but the Obama administration is reportedly rolling out a new program to address the still-high rate of foreclosure in the residential housing market. “We would like to get back to an all-Treasury portfolio within a reasonable amount of time,” Fed chairman Bernanke said yesterday in testimony in a session of the House Financial Services Committee. But not any time soon. We’re unlikely to see an imminent unwinding of the central bank’s massive portfolio of mortgage-backed and debt securities issued by Fannie Mae (FNM) and Freddie Mac (FRE). The reason is hardly a secret. The real estate market is still weak, as suggested by the latest updates on new home sales and existing home sales. But new purchases are reportedly set to end. “The Fed is on track to shut down a $1.25 trillion mortgage-securities-buying program at the end of this month,” the AP reports. Meantime, the housing market remains a drag on the economic recovery. Echoing the troubles in the labor market, the housing industry, while no longer contracting across the board at a steep rate, isn’t yet showing clear signs of health. Recognizing the challenge, the White House is moving ahead with a fresh effort to stem the tide of foreclosure and the related financial turmoil it brings to homeowners. More than 2,000 Massachusetts homes went into foreclosure in February, a sign the state’s housing problems are not going away soon. The number of foreclosure petitions, the first step in the process, increased 13.2 percent to 2,122 from January, according to data released yesterday by the Warren Group, which tracks real estate. Though the number of petitions was down 7.5 percent from the same month in 2009, the figures still point to a steady flow of homeowners who are struggling to pay their mortgages, said Timothy Warren Jr., the firm’s chief executive. The data for foreclosure deeds, the last step in the process when a lender takes back a property, were mixed last month. The number of deeds dropped 19.6 percent to 917 in February, compared with the January figures, but increased 10.4 percent from the same month a year before. The number of foreclosure auctions tracked by the Warren Group more than tripled in February to 2,771, compared with the same month last year. Only a few months ago, the housing market had been showing signs of strength as it recovered from the most painful downturn in decades. Much of the improvement, though, came from government programs that held down mortgage rates and provided tax breaks for buyers. Since the fall, sales have sunk. And the government support is running out. 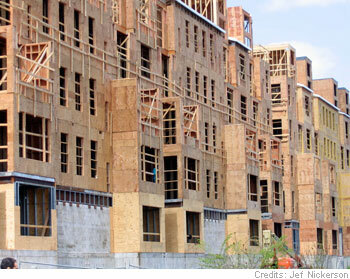 The latest sour news came Wednesday, when the Commerce Department said sales of new homes fell last month to their lowest point on record. It was the fourth straight drop. “While bad weather could well have suppressed the February result, it was dismal no matter how one tries to slice and dice it,” wrote Joshua Shapiro, chief U.S. economist at MFR Inc.
That news followed a report a day earlier that sales of existing homes fell for the third straight month in February, to their lowest level since July.